I know that cooking doesn't EXACTLY fall into the realm of crafting, but for me it's definitely a chance to branch out creatively. So, hopefully this post falls in line. I've been following the feed at I'm an Organizing Junkie for some time now (over a year probably) mostly for the Menu Plan Monday. I recognize that weekly menu planning does take a little time out of my schedule, but it's so worth it when I'm not running to the grocery store every day like I used to. Now that I actually have the time to make out my plans, it makes my day and week go so much smoother. I admit that Pat and I may not always stick to the plan, but if we skip a meal I have planned it goes on the menu for the following week. It really does make life a little easier. I do plan for all meals (B=Breakfast, L=Lunch, D=Dinner) and snacks since we are home all day long and I want to make sure we have enough food. I'm sure there's more I want to say about menu planning, but I'll save that for another time. 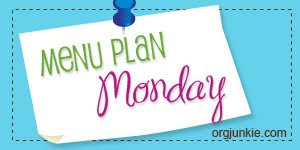 For now, this is my first submittal for Menu Plan Monday. So that's it. It's nothing special really. But I know how much others sharing their plans has meant to me, so I figured I'd get in on the sharing!! For my regular blog readers, please let me know if this is something that interests you or not. You know I'm always shaking things up around here!! I'm so glad you appreciate it. While I haven't gotten many responses on this NEW aspect of my blog, I did have a few friends comment on Twitter and Facebook. I tihnk I might keep it. Look for me to post this week's at some point today . . .hopefully. I've got some other chores to tackle first!